I have been using cloth diapers since M was about 3 months old. When doing all my cloth diaper research and talking to friends who used cloth diapers, I was told that I had to use “cloth diaper safe” detergent so that my diapers wouldn’t start repelling and cause leaks. 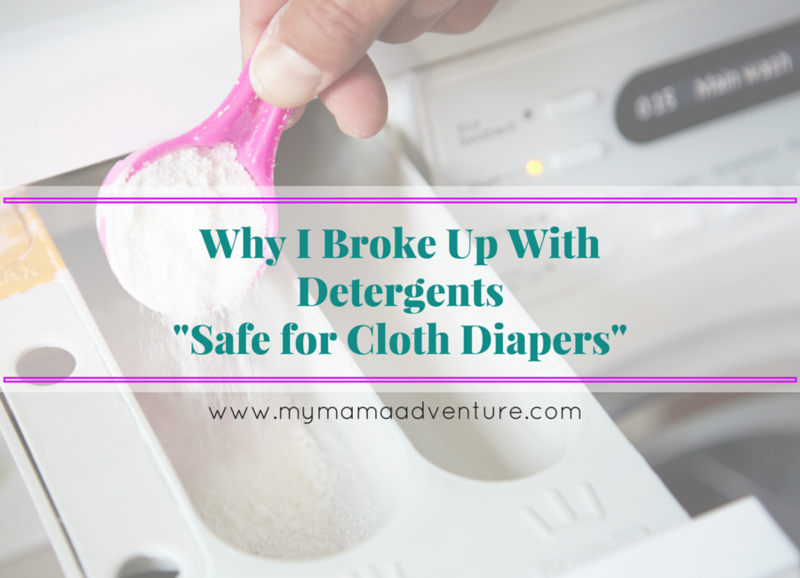 I was new so I had no idea what I was doing, so CD safe detergents was what I chose to use. The entire time M was in diapers we used these CD safe detergents and occasionally Tide near the end when I read that many people had success with Tide. We stopped using diapers altogether with M just before he turned 3 years old (night time was the hardest to get him out of diapers). So, it had been months and months since I did any sort of reading on cloth diapers and then months since I had used cloth diapers at all by the time Baby H was born. Wouldn’t you know it, there was some big huge movement in cloth diapers over the past year that I had no idea was happening. And I even admin my own cloth diaper group on Facebook! About a year ago a new website and Facebook group called Fluff Love & CD Science came on the scene. I just discovered them within the past 3 months or so, just before Baby H was born actually. Fluff Love U recommends only mainstream detergents, in fact, they have a huge detergent index on their website that reviews hundreds of detergents. The index tells you what detergents work well with HE washers, standard top loaders, how much detergent to use, etc. It’s kind of incredible. I was skeptical at first so I continued to read and eventually decided to give mainstream a try. Okay, truth be told, I decided to use Tide. It seemed safe to me, the compromise between “cloth diaper safe” detergent and mainstream. I’ve since completely switched over and even stopped using Tide. Tide is pricey, and as I mentioned before, I’m not working, so we’ve also tried both Wisk and Purex. I gave Seventh Generation a try since it’s pretty green, I was unimpressed though. I love their products, but for getting my diapers clean I was having to use far too much detergent and it wasn’t worth it for me (and our budget). I’ve found this to be true for most of the plant based detergents that we’ve tried. I’ll continue to use them on our clothes, but for diapers, it just wasn’t cutting it for us. We’ve had really good success though with Purex and Wisk though. You know what? I’ve been sold. The entire time we used pocket/microfiber diapers with M we had horrible ammonia issues. I mean burn your nose and eyes ammonia. It wasn’t out of the dryer stink, it wasn’t even right after he peed stink. It was sitting in the wet bag for 2 days stink. I assumed M had “stinky pee.” That’s what I always said, for over 2 years I’d say “M has stinky pee, I’ve accepted this.” We battled ammonia rashes, at one point he even got blisters! But after my research with Fluff Love, I discovered that even the ammonia stink from in the wet bag wasn’t normal. It shouldn’t have been happening and it meant his diapers weren’t clean enough. It would explain why he would get ammonia rashes. I feel horrible, but now I know better. How did they convince me? Well, honestly, it’s the pure logic that makes the most sense. Logic and science. Logic #1: Cloth diapers have been used for generations and generations. My mom, my grandma, my great grandma did not use special detergent to clean their diapers. They used the same detergent they used on their clothes. Okay, so how do I know that they didn’t have repelling issues? I don’t. But my clothes don’t repel liquids, our towels have never repelled liquids, so why would our diapers? There’s no reason why and they don’t, not after almost 3 months of going mainstream. Logic #2: Cloth diapers are the absolute dirtiest articles of clothing going into our washer. Without a doubt. But for some reason all those CD safe detergents tell me I can use less than I use on my clothes. I was never sold on that, even when I did use CD safe detergents. I’d always use more than necessary while a little panic button in my head would be concerned with repelling or left over detergent in my diapers, so I’d do the extra rinse at the end – just in case. Forget that! I’m now using mainstream detergent and using the recommended amount for heavily soiled clothes. Ya know what? My cloth diapers come out smelling amazing and even after 2-3 days sitting in a wet bag, no stink. The only stink I smell is when Baby H has a random stinky breastmilk poop. No ammonia smell what-so-ever. The Science: I’m not going to get into the science behind traditional cloth diaper detergents and mainstream detergents. It’s all about surfactants, yada, yada. I read the information and it made sense to me. If you’re interested, feel free to read up on it yourself on the Fluff Love website, it’s quite detailed! Those three points alone have me sold on mainstream and the fact that we’ve had no issues with it. But this is not a sell for Fluff Love University. They may have converted me through logic and science, but I have to be honest and admit I am not a huge fan of their FB group. It was great for getting information and for asking the occasional question, but the group itself is kind of judgmental. More than once I’ve seen other moms posting criticisms of other CD groups and other moms who aren’t sold on mainstream detergent. Moms who have joined the group seeking help and just having other moms jump down their throat when they say their CD safe detergents work fine with no stink issues. This bothers me. I get the science behind the whole detergent thing, but there is absolutely no reason to jump down a mom’s throat or to become so judgmental. There is no reason to bash another mom from another group who can’t even defend herself. The website though, it’s definitely a resource. I now use the Fluff Love DIY method for stripping and bleaching pre-loved diapers. I frequently have referred back to the detergent index, it’s a great resource, just be weary of the FB group if you choose to join it. So, there you have it. I’ve ditched the crunchy detergent for mainstream detergent. It’s working for us, I certainly can’t say it will work for everyone. All I know is that our diapers have never smelled or looked so clean before. The only time we’ve ever had a rash issue is when Baby H has had a poop and I didn’t realize it at first but our trusty Earth Mama Angel Baby Bottom Balm works like a charm to clear it up, usually within one diaper change – unless the next diaper change is a poop of course! We do get some redness when we use natural fiber diapers (our prefolds and fitteds), but they aren’t stay dry like our pocket and AIO dipes so I cut up some fleece to make fleece liners and lay them on top and no further issues with redness. What I do know is that it’s not because of ammonia like in the past, no blisters, no stink. I call it a win. What kind of detergent do you use for your cloth diapers? I use regular detergents too. I like how fluff love & cd science makes it seem a lot easier than most sites. When sites focus on special detergents, long prepping methods, etc it scares a lot of families away from trying cloth at all. I agree, having to learn cloth diaper laundry is daunting enough, adding in special detergents just makes it more difficult.